My question today is regarding my sand-sifting star. Having been classically mis-led at the LFS into buying him for my 65g reef tank, I wanted to place him in a good home, rather than just return him to the store where he would likely be sold into another too-small home. I have found him a home in another keeper's 120g reef tank, where he will be able to happily munch pods to his heart's desire (or whatever organ makes a star feel and love). So when he next pops out, I'm going to quarantine him, and coordinate a drop-off. So, what considerations are there for the little guy to happily make the 30-60 minute trip? How hardy are stars in terms of moving? Is an LFS sized bag full of water sufficient? Should I put him in a solid container (like a zip-loc/Tupperware type thing)? I have a battery-powered air pump and stone, is that needed or will he be okay? Would he benefit from a bit of sand from my tank in whatever he gets put in? I know not to expose him to air moving him from the tank to the transport container, anything else I should bear in mind? 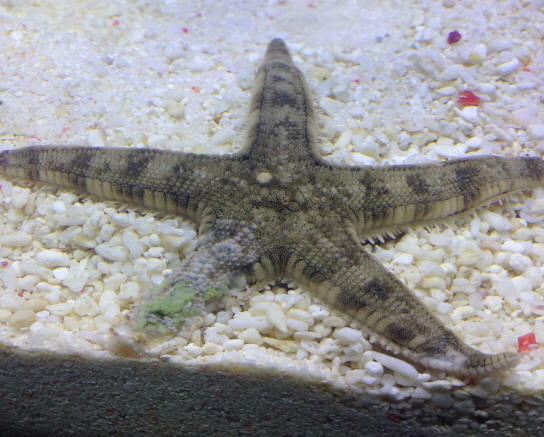 Can a sand sifter star fish live in gravel? I'm am newish to marine tanks and I know this may sound like a stupid question but thought I should do some asking before I do any thing. can he burry himself in the gravel/crushed coral?